In the quest for establishing causality between maternal Zika virus infection and Microcephaly (which remains strongly suspected, but as yet unproven), one of the important steps is determining how the virus plausibly causes the kind of observed damage to developing brains. Previously we've seen studies suggesting AXL as a Candidate Zika Virus Entry Receptor and that Zika Virus Infects Human Cortical Neural Progenitors. Yesterday, another study appeared in the Journal Science, which examines the effects of ZIKV infection in human neural stem cells growing as neurospheres and brain organoids. Neurospheres are clusters of neural stem cells, while brain organoids (aka `minibrains') are lab grown tissue that resemble the brain's development found during the first trimester. In the present study conducted at IDOR in conjunction with UFRJ, the research team observed that ZIKV infects human-derived iPS neural cells, neurospheres and cerebral organoids causing cell death, malformations and reducing growth by 40%. They then repeated their experiment, this time using the Dengue Serotype 2 virus, and saw no comparable damage. The researchers also compared these results with the ones generated with Dengue Virus (DENV2). Even though DENV2 infected the cells such as ZIKV, there were no damaging outcomes registered to the neural cells, neurospheres or organoids. Since the emergence of Zika virus (ZIKV), reports of microcephaly have increased significantly in Brazil; however, causality between the viral epidemic and malformations in fetal brains needs further confirmation. 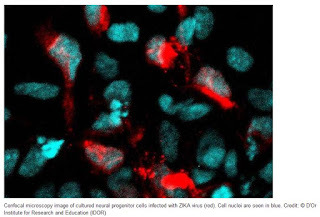 Here, we examine the effects of ZIKV infection in human neural stem cells growing as neurospheres and brain organoids. Using immunocytochemistry and electron microscopy, we show that ZIKV targets human brain cells, reducing their viability and growth as neurospheres and brain organoids. These results suggest that ZIKV abrogates neurogenesis during human brain development.